It’s never too late for a church to reach out to the community. Let’s start today. The leadership doesn’t model it. Intercessory prayer is not a true value. 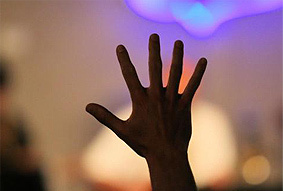 Sadly, the average church spends more time in church announcements than intercessory prayer. In some churches, the high task of intercessory prayer is relegated to a small group of prayer warriors. In this sense, pastors delegate the duty of prayer so they can devote themselves to preaching. But when the church came together in Acts 2:42: they devoted themselves to the apostles’ teaching and to fellowship, to the breaking of bread and to prayer. And in Acts 6:4, the apostles delegated other duties so that they could devote themselves to prayer and the ministry of the Word. Evangelism training rarely happens (if at all). Most churches don’t have a consistent way for church members to be equipped in effectively engaging in Gospel conversations. Or better yet, why not do an annual sermon series on how to share your faith? Why not make it part of the fabric of growing in one’s faith just like giving, praying and Bible study? Or why not have ALL your small groups go through a series on evangelism? To help, Dare 2 Share has a brand new faith sharing app called “Life in 6 Words.” It’s free on theiTunes store and GooglePlay. We also have a brand new adult-focused 40-day devotional called “6 Words That Will Change Your Life” that can be used in combination with our adult-focused small group curriculum to help adults gain a sense of Gospel Fluency. The Gospel is not relentlessly given. When you give the gospel consistently in your church meetings, then the church members know that any time they bring an unreached person they will hear the gospel. As a pastor, I gave the gospel at the end of every sermon and we saw people come to faith weekly. Why? Because people invited friends, family and neighbors to church because they knew that the gospel would be given clearly and consistently. This can also happen in small groups. As a matter of fact, there are specific small group strategies like Alpha and Seeker Small Groups that have resources for churches to start small groups that reach out to the lost. In far too many churches, outreach has been generalized to the point where the verbal articulation of the Gospel has been exchanged for collecting food for the poor, ministering to the marginalized and reaching out to the hurting. While it’s good to do good, it’s better to do great. And what’s great is when churches meet the physical AND spiritual needs of their communities by sharing the Gospel with their lives AND their lips. Government agencies can take care of physical needs. But only the church can take care of physical and spiritual needs. At the end of the day, we are not fully doing anyone true justice if we withhold from them the message that can save their souls and transform their lives both now and forever. Evangelistic storytelling is not a part of the culture. In churches that are effective at evangelism, stories of changed lives and saved souls are told consistently. These stories inject Gospel urgency into the congregation. And it gives church members a sense that reaching the lost with the hope of Jesus Christ can truly change their church and their community. True stories of disciple multiplication help believers move all this talk about evangelism from the “fiction” shelf of their mental library to the “nonfiction” section. Think about why we love the book of Acts. It’s the stories of changed lives! When we carry on the mission of the early church and share stories along the way, then more and more believers get fired up about engaging co-workers, family and friends with the good news of Jesus. What about having a “Missions Moment” in the church service where a story of impact can be told about lives “across the street and around the world” that are being changed through the Gospel? My prayer for every church leader reading this is that he/she can glean some insights to practically apply right away. I’d strongly encourage you to start with prayer. As you pray for the lost in your community, God will give you the urgency and strategy you need to make evangelism a true value in your life personally and in your ministry publicly. It’s time for your church to reach out. It’s time for you to lead the way.